“Peace on earth” is great, but podcast rivalry or antagonism can be painful and counterproductive. 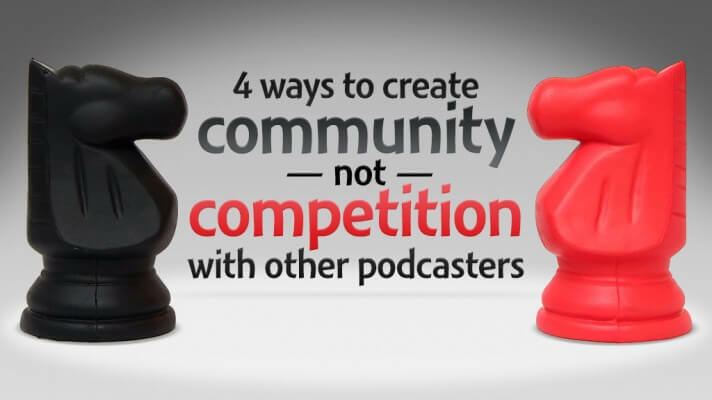 Instead, use these tips to build community among others podcasting in your niche. What we typically call “competition” in podcasting is usually a product of our minds, and is usually more like antagonism—active hostility or opposition between groups. Antagonism is driven by a feeling of scarcity, that consumers only have enough time for one podcast in a particular niche, and we want to beat out all the others for that person's interest. Instead, look at “competition” from a perspective of abundance, that consumers have time for plenty of podcasts on their interests, and will usually subscribe to more than one. I like to think of the niche or subject as a three-dimensional object. Each of us approach it from a different angle and different step in the process. Some may prime, some paint, but each on their side. In podcasting, we bring our unique perspectives and experience to help complete the understanding of the subject. This is the biggest but most important step, which is why it's first. I do not think of other podcasts in my genre to be competition but rather extensions or complementary to my podcast. I specifically avoid a lot of the mainstream topics or products or devices that other podcasts/blogs are covering to distinguish myself from them which prevents “competition.” Since I cover technology there are tons of news, products, services, and discoveries which are not being picked up or featured on the larger and more well-known blogs/podcasts. Some of my best friends are podcaste's in the same genre and mentioning each other's podcasts only helps us. It depends. If you believe they did it to drive your podcast out, then I have a problem with it. Otherwise, competition is good. Keeps you on your toes. I take the approach that the more competition there is the better. Competition increases the pie (listeners) we are all working with. Interestingly I have approached at least 10 competitors in the past six months either to appear on my cast or to cross promote. Two have taken me up on the call, the rest . . . well radio silence. I go with the view that my podcast is tiny and I really can not “compete” with the larger podcasts of my genre. I do a video game based show, and I accept the fact that most of my listeners will put IGN, 1UP, GiantBomb, or one of the other big shows before mine. I use to record long shows that were 1 to 1.5 hours long. After doing a poll with my listeners, I found out that a little more than half that took the survey said they would prefer shorter shows from me. So I changed from a biweekly to a weekly format and shortened the show to 30 to 40 minutes long. I got good feedback from my listeners after doing the change. I'm constantly keeping in my mind that I know I'm not big, so I don't want to overwhelm my listeners with too much content. That's how I look at it. I know I'm one of the smaller shows right now, and I accept it. My show isn't even a year old yet so I'm actually pretty happy with where I am right now. I don't believe in such a thing as podcasting. I look at it as a DVR vs. Scheduled programming. Scheduled programming you must be there to view it at the time, so the competition would be fearce. Thanks to VCRs and DVRs, you can have both. You can watch it now, or watch it later. And since you can usually record more then one show at a time, you can get both programs you love. The same is true for podcasting. I download the shows I like for future consumption. Some I have to seriously catch up on, others I listen to religiously. As far as other Trek podcasts, I'm a very small fish in their large pond. So as such I try to build relationships with them. I announce the heck out of them so that they will return the love to me. It's worked quite well. They get my audience's eyes on them and they direct their listeners to take a look at me. Competition in podcasting? No, don't believe in such a thing. Net based broadcasting is at the core a personality medium. If you look at the multiplicity of tech news shows – each one has a choice of approach that finds an audience even though the same news items are being addressed. The more “competition” there is, the stronger the probability that the personal following will resonate for a given podcaster and generate a loyal audience. If you know you have a lot of choices you will seek the show length, content and presentation that you like. The classic economics class illustration is the lone ice cream stand and the beach will starve for customers, but “ice cream row” or a food court will prosper because people will know they will find something there. The need is for ~more~ shows, particularly on video, to keep consumer attention focused on that spot between User Generated Content (UGC) on YouTube and full commercial productions, as a vibrant, interesting and valuable media conduit. Knowing that we're approaching he same subject from different perspectives and experience, consider how you can complement or supplement what others are already saying. I listen to my “competition,” not so I can figure out how to beat them, but so I and add to the overall subject. What can you use in your own podcast and give credit to the source? What can you refer your audience to so your podcast can be comprehensive? What can you say that hasn't been said? What can you build on to go into more depth? Don't be a loner in podcasting! Reach out to the other podcasters and try to work together. Be guests on each other's shows. In the podcasts about podcasting space, we're already doing this with Podcasters' Roundtable, and I'm starting a Once Upon a Time roundtable with other podcasters. There's a great Bible verse that says, “If possible, so far as it depends on you, live peaceably with all” (Romans [12:18], ESV). Our “competition” won't always play nicely. Even then, we should be the “better podcaster”: continue to encourage community and encourage our listeners to get the broader perspective by consuming the other podcasts, too. Stay humble by realizing that others have knowledge and experience you don't have. This may sound strange to some. But the short answer is…I encourage it and I help promote the new shows. I podcast about the hobby of amateur radio. The content I produce is to help educate and inspire my listeners…it is all about the greater good of the hobby. My practical amateur radio podcast hit the 4 year mark a few weeks ago. I've seen many podcasts come and go in this time. I've encouraged and I've helped to promote all podcasts about the hobby. I maintain a list of all the amateur radio podcasts I know about on my website. The true list of active amateur radio podcasts (producing content on at least a monthly basis) is a short list. Just about all I know think of their podcasts as just an extension of the hobby. That has certainly been how I felt over the years. I would include my podcast in a list of about 3-4 podcasts which are actively produced/released once a month or more. While some are certainly more shiny and have much deeper pockets (I would put Leo Laporte/Bob Heil's Ham Nation in this category). The rest of the three of us are just doing all we can do to help promote our hobby. Of course I don't expect all podcasters to have the approach I do towards podcasting. Upcoming: how will you podcast differently in 2013? Many people like to make New Year's resolutions. I like to consider these goals, and they should be reasonable. But beyond special goals or resolutions, how are you planning to podcast differently in the coming year? Will you be changing your branding, enhancing your marketing, redesigning your website, jumping into video, starting a new podcast, or anything else different from how you podcasted in 2012? I would love to include your thoughts in an upcoming episode of The Audacity to Podcast! Hello Daniel. Thanks for the subject. Good things to think about. Helpful especially because I’m coming off of a podcast hiatus and finding my way back into a podcasting community. I feel collaborating is a useful tool in helping to create that. And I would add that having the confidence in my own “voice” and offerings to listeners that may actually be unique. So not to worry, in a sense. Thanks!